This palak / spinach rice recipe is a healthy rice recipe with a nice flavor of garlic and fresh coconut. This is easy to make rice recipe with spinach. My little toddler doesn’t like to eat plain rice with dal, so I make variety of rice recipes for her .she loves this palak rice and calls it green rice. To make this recipe more nutritious and tasty I have added fresh coconut to it. 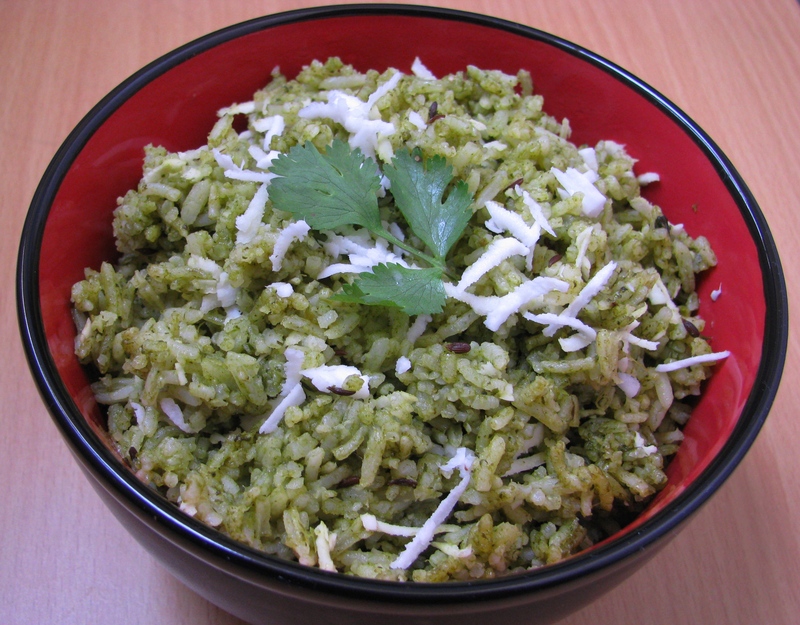 Fresh grated white coconut gives very tempting look to spinach rice. This recipe can also be cooked with coconut milk to make it tastier; well it will increase the calories of it. The following recipe which I have prepared is done without coconut milk; you can add coconut milk in place of plain water in this recipe. This fried spinach rice with garlic is a good option for lunch . You can add fresh Paneer/Tofu pieces while cooking this palak rice to make it more nutritious. To make palak rice more colourful add carrot pieces, green peas, roasted peanut, grated coconut etc. You can also add potato slice in spinach rice while cooking it . If you eat egg add scrambled egg to cooked spinach rice. Add fresh lemon juice to palak rice according to your taste. This spinach rice is so tasty that you can eat it without any companion dish .well you can Serve this fried palak rice with plain curd /yoghurt , raita ,kadhi or any healthy pickle. I have explained the spinach rice recipe with coconut and a nice garlic flavor. Do share what variations you do with your palak rice. Share your queries and suggestions for this recipe. 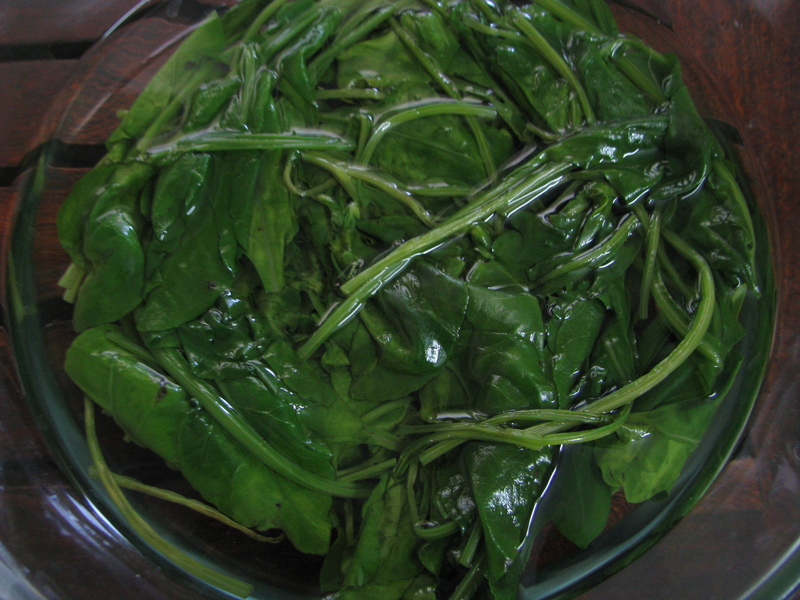 Wash palak (spinach leaves) and microwave it for 5-6 minutes or boil it. Make a fine puree of palak (spinach) by adding little water make 1 cup of palak puree . Take green chilies, garlic cloves and 1 pinch of salt in mixer jar and make coarse paste of it . 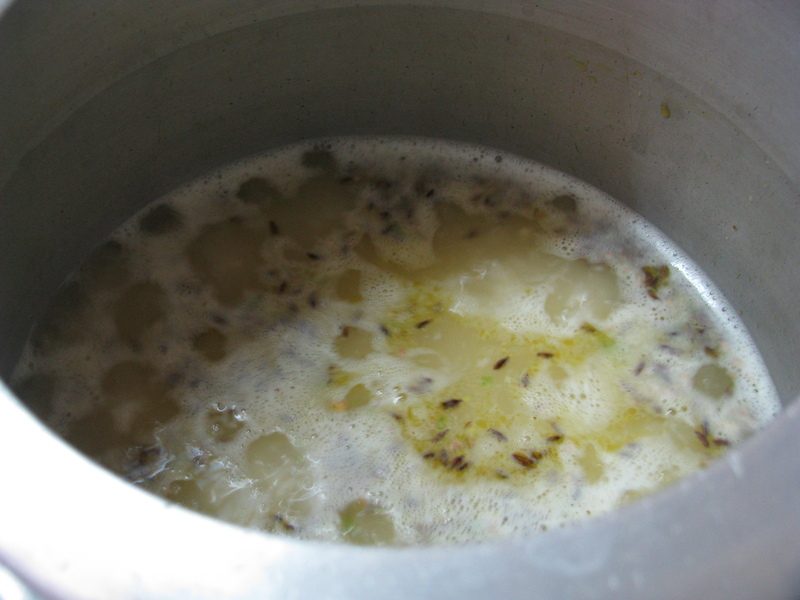 Heat oil in a pressure pan, add cumin seeds, green chilly garlic paste to it and sauté it for few seconds. Add rice with water / coconut milk (in which rice is soaked) let it boil . Now add palak (spinach) puree and lemon juice and little salt (as u have already added salt in chili garlic paste) to it. When it starts boiling cover the pressure cooker pan and cook it for 6-7 minutes on low flames. As the rice is soaked, it won’t take much time to cook. Add grated coconut, mix it and serve it hot with raita or kadhi or curd.